Germany occupied western Poland in fall 1939. Much of this territory was annexed to the German Reich. Eastern Poland was not occupied by German forces until June 1941. 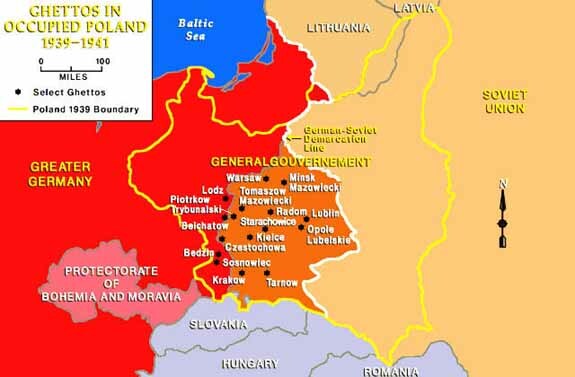 In south-central Poland the Germans set up the Generalgouvernement (General Government), where most of the early ghettos were established. Ghettos were enclosed districts of a city in which the Germans forced the Jewish population to live under miserable conditions. Ghettos isolated Jews by separating Jewish communities both from the population as a whole and from neighboring Jewish communities. The Warsaw ghetto, established on October 12, 1940, was the largest ghetto, in both area and population. There, more than 350,000 Jews--about 30 percent of the city's population--were eventually confined in about 2.4 percent of the city's total area.